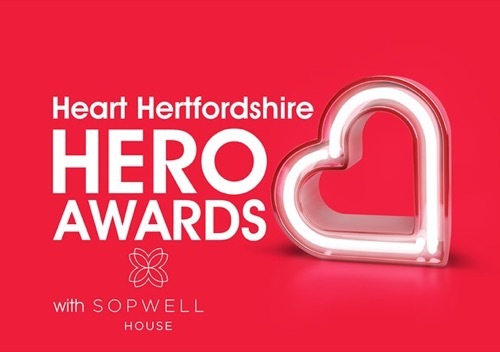 Heart Hertfordshire have partnered with Sopwell House to bring the second year of ‘Hertfordshire Hero Awards’ to Hertfordshire. This exciting initiative provides listeners with an opportunity to celebrate those who really make a difference. The awards will recognise heroes and hear stories about the nominees who make a difference to their local community. There are 11 categories including, ‘BIG Heart Award’, sponsored by Sopwell House, ‘Parent Award’ and ‘Community Award’. Nominations are free and people who nominate will be automatically entered into a prize draw to win an overnight stay at Sopwell House. Finalists will be invited to Sopwell House for an exciting awards ceremony on Friday 28th September, a glamorous evening of spectacular food, awards and entertainment. Winners will be announced where the Hertfordshire Heroes will be congratulated by Sopwell House and Heart Hertfordshire.